Outstanding centerfielder and team leader played eight seasons for the Chiefs. Alex won chmapionships with the team in 1990, 1992, 1995 & 1997. He is currently eighth on all-time Chiefs' career hit list with 213 and ninth in RBI's with 116. Scored the winning run in the Chiefs' 1990 seventh game extra inning walk off win over the Augustine's A's. Alex Retired from playing in 1997. Inducted into the Intercity League Hall of Fame in 2013. Dave enjoyed a long ICL career, playing in the league from 1973-1997. He played his last nine seasons with the Chiefs (1989-1997). Was considered one of the best second baseman ever to play in the ICL. Won four Championships with the Chiefs in 1990, 1992, 1995 & 1997. 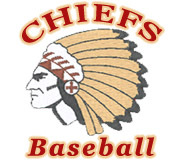 "Cliv" had 328 hits while wearing the Chiefs colors, good for fifth place on the all time list, and is currently eighth in RBI's with 167. Retired from playing in 1997 and finished his career with a home run in his last at bat in the Chiefs' championship clinching win. Inducted as a Charter Member of the Intercity League Hall of Fame in 2010. Steve started his Chiefs' career in 1992 and became a fixture at third base for the next nine seasons. Won three Intercity League Championships in 1992, 1995 & 1997. He is fifth on the the Chiefs all time homer list with 32 and sixth on the RBI list knocking in 192 runs. He checks in at number seven on the all-time career hit list with 273. "Dales" retired from playing in 2000. Inducted into the Intercity League Hall of Fame in 2014. Mike was the Chiefs regular first baseman from 1990-2007. He is second in every team career offensive category and first in games played. Hit 44 home runs, drove in 356 runs, and recorded 538 hits. Was equally capable with the glove and is considered one of finest defensive first baseman in Intercity League history. Was part of four Chiefs' championship teams (1990, 1992, 1995 & 1997). Began his ICL career as rookie in 1990 and retired from playing in 2007. Hank "The Hammer" was one of the best pure hitters ever to put on a Chiefs' uniform. Played several seasons for the Milwaukee Brewers before joining the Chiefs in 1989 and played for ten years. Is fourth in all-time homers (40), seventh in RBI's (186) and eighth in hits (238). Was a member of four Chiefs Championship teams. Hit a career high .383 in 1993. A graduate of Brown University. Retired from playing in 1998. Hank passed away at the age of 52 in 2013. Inducted into the Intercity League Hall of Fame in 2011. Dave is the Chiefs' all-time leader in every pitching category. Won 120 games in his ICL career, the last 99 with the Chiefs. Was the leader of the pitching staff and the Chiefs go to guy for nearly two decades. Leads the franchise in wins (99), Appearances (204), Innings Pitched (1,028) and Strikeouts (778). Was a member of four championship teams (1990, 1992, 1995 & 1997). Was inducted into the Intercity League Hall of Fame in 2011. Mike joined the Chiefs at the end of the 1989 season and was considered one of the best defensive catchers in Intercity League history. "Romo" played eight seasons with the Chiefs' and won three ICL crowns. He is 11th on Chiefs all time hit list with 194 and also 11th in RBI's with 109. Mike played in the Cincinnati Reds farm system before becoming a Chief. Retired from playing in 1996. Inducted into the Intercity League Hall of Fame in 2012. Mike was a fixture and part of the identity of all the great Chiefs' teams from 1989-2000. "Barnsey" made more starts in right field than any other player in history during his 12 year Chiefs career. He is high up on all Chiefs career batting lists, including third in hits (365) and and fourth in RBI's (203). Mike won four ICL titles (1990, 1992, 1995, 1997). Retired from playing in 2000. Ari had a long and illustrious Intercity League career. Ranks second on the Chiefs' career lists in both all-time career appearances with 120 and innings pitched with 615. His currently third in all-time pitching wins with 49 as well as strikeouts with 328. "Kouf" won three ICL titles in his eleven seasons with the Chiefs in 1992, 1995 & 1997. Pitched an amazing 102 innings in 1993. Retired from playing in 2002. Joe's Chiefs' career was hampered by arm problems that prevented him from being one of the best ICL pitchers of the 1990's. He stayed healthy enough to go 9-0 in 1992, leading the Chiefs to another Championship. Ended up playing eight seasons with the team 1990-1996 and then attemped a comeback in 2003. Won two Championships with the Chiefs in 1990 and 1992. Ranks seventh in all-time in team wins (28) and appearances (69). He is also seventh in both strikeouts with 194 and in innings pitched (275). Retired as a player in 2003. Inducted into the Intercity League Hall of Fame in 2015. Jon had back to back 12-1 years for the Chiefs on the mound in 1992 & 1993. Was the winning pitcher in the 1992 seventh game championship. Struck out 83 batters in 1993. "JD" is fifth in Chiefs' career pitching wins (37), sixth in appearances (70), fourth in strikeouts (288) and sixth in innings pitched (365). Was a member of three Chiefs Championships (1990, 1992 & 1995). Inducted into the Intercity League Hall of Fame in 2017. Warren was perhaps the most prolific power hitter in Chiefs' history. Won three ICL Championships (1990, 1992 & 1995) in his eight year Chiefs career. Hit a ICL best .451 in 1989. Great arm behind the plate. Is third on homer hist (41), fifth in RBI (200) and sixth in career hits with 304. Played professionally for both the Boston Red Sox and the Milwaukee Brewers before signing with the Chiefs. Retired as player in 1996. The Chiefs' all time leader in every offensive category. Former team captain came onboard as a rookie in 1994 and played for 16 seasons as the Chiefs' cleanup hitter until his retirement in 2011. Leads the franchise with 91 home runs, 417 RBI's, and 567 hits. Considered one the best power hitters in Intercity League history. Was part of two Intercity League Championships (1995 & 1997). Coach Cal was with the Chiefs' organization for over 28 seasons until his untimely passing on April 25, 2017. Was part of six championship teams in 1990, 1992, 1995, 1997, 2012 and 2014. Served as the Chiefs' Bench Coach.